This is the most common of all domestic water systems. The system consists of a cold water tank (or cistern) normally in your loft and a hot water tank (or cylinder) normally in your airing cupboard. It is called a low pressure gravity system because the water is kept under pressure via the gravity-fed water delivered from the cistern. How much pressure is produced is determined by the height at which the base of the cold water cistern is situated above the outlet. This is typically a minimum height of 1 metre for showers. The greater the height of the cistern above the shower head the more pressure is created. If you have this system you can install a mixer, pumped digital or all-in-one power shower and you will have get a great showering experience. If you decide on a mixer and want a more forceful shower, fitting a pump will boost the flow rate and pressure even more. A combination boiler heats cold water direct from the cold mains supply as soon as you turn on the shower or a hot tap in your home. The boiler is normally wall mounted and you will not have a cold water tank (cistern) in your loft or a hot water tank (cylinder) in your airing cupboard. Because the water supply to the system is mains fed this produces a forceful showering experience. For a powerful showering experience we would recommend fitting a digital or mixer shower to this type of system. 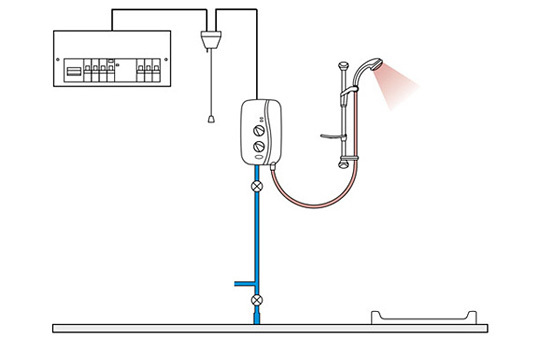 Alternatively, for a more gentle flow rate you could use one of Mira's electric shower fitted to the cold mains. This is also an ideal low cost option for a second bathroom or en-suite shower room. 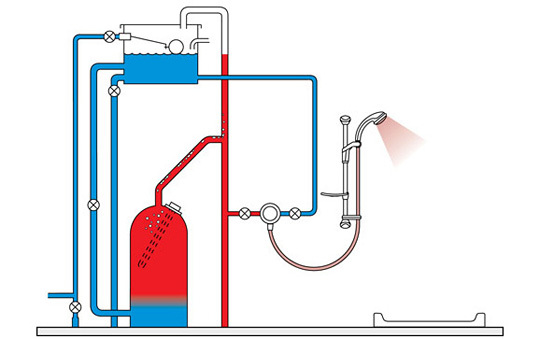 An unvented mains pressure system, stores mains pressure water in a large strengthened hot water tank (cylinder), usually found in the airing cupboard. The hot water will be heated either by immersion heaters fitted in the side of the cylinder or by a central heating boiler. This type of system doesn't require a cold water tank (cistern) in your loft and provides a high water flow rate and pressure. Other systems also producing hot water at mains pressure are available, these are generally known as thermal store systems. To make the best use of the flow and pressure of these systems, we would recommend a digital or mixer shower. Alternatively, for a more gentle flow rate you could use one of Mira's eco mixer showers, or fit an electric shower to the cold mains. This is an ideal low cost option for a second bathroom or en-suite shower room. If you do not have, or do not want to use your stored hot water, then an ideal solution is to fit an electric shower to the cold mains supply. The benefit of an electric shower is that there is always ready to use heated water, as it is heated instantaneously within the shower. 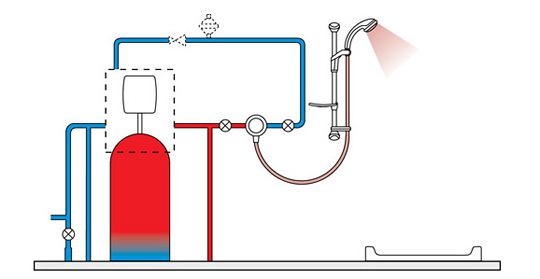 The amount of hot water flow produced by an electric shower depends on the power rating measured in kilowatts (KW). The higher the KW rating the better the flow. 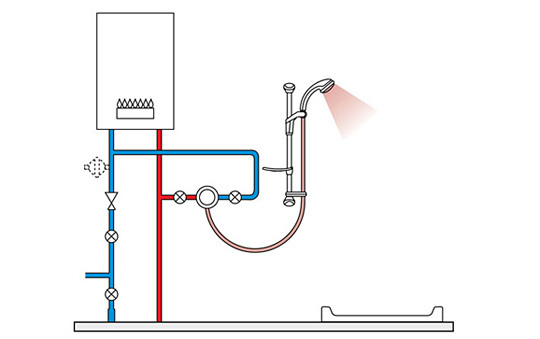 Most mains water supplies will provide enough pressure to operate an electric shower. In the rare instance that it cannot, then Mira has an alternative pumped electric shower. This must be fitted to a cold water tank (cistern) supply and the internal pump will then generate the pressure normally provided by the cold mains.